VietNamNet Bridge – At the end of the lunar year, people rush to see fortune-tellers to know about what will happen in the New Year and to seek suitable people as the first New Year’s caller. On the afternoon of a Saturday, the home of a fortune-teller named Toan in Thanh Xuan district, Hanoi, was covered by incense smoke. Customers one by one put money on a plate, placed the plate on the fortune-teller’s altar and showed their hands to the fortune-teller. All of them solemnly listened to each word of the fortune-teller about their future. Waiting for her turn, a middle-aged woman said that she is a familiar customer of the fortune-teller but it was difficult to see him because he had to go to many provinces to hold rituals. After seeing the fortune-teller, the woman said that this year her family should choose one who was born in the Year of the Mouse as the first New Year’s caller and organize the rituals to relieve themselves from bad lucks. Another woman was told by the fortune-teller to hold a star worshipping ritual, also to relive her family from bad lucks. She said that she often consulted this fortune-teller whenever she had a business affair or before she had business trips, etc. A fortune-teller named Thanh in Cat Linh Street, Hanoi, is also very crowded in the late days of the lunar year. Thanh is over 70 but he is still in sound mind. After asking customers their birthday, the old man opened a PC, printed an astrologic chart and answered all questions of customers. A woman said she came from Hung Yen province. “I’m not superstitious but it is my habit to consult fortune-tellers at the year end on how to choose the first caller of the New Year’s Day and what hour and what day should I go out on the first day of the New Year. It is better to see fortune-tellers in Hanoi. Mr. Thanh told me that I was born in the Year of the Dragon while the upcoming year is also the Year of the Dragon, so I should not do big business and travel far from home,” she said. After consulting the fortune-tellers, customers showed off their feeling very clearly on their face. Some women immediately called their husbands to tell them about the results. 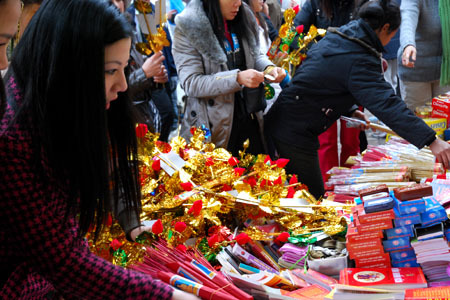 Oriental cultural expert Vu Duc Huynh said that people should not highly expect on the first caller of the New Year’s Day because this is only a psychological therapy. This person should only be joyful and open to create good atmosphere for the family he/her visits.